This post is the 4th of 5 posts discussing four digital sales essentials for small business. The part you do not know. Marketing Automation, Lead Capture, and CRM? And how they can work together to generate leads and revenue? First, you must think of your website, email, and other digital tools as agressive selling tools. Today, your customers expect you to be good at this. So... the en vogue term is “Marketing Automation”. It’s what the very big web marketers have been doing for a long time. Think about how Amazon “knows you” when you shop. It displays items specifically relevant to you. Amazon remembers you when you visit. It sends you emails about your purchase. It offers you other relevant products. It sends you reminders and offers. Your website can act like that too! Today, several different Software As A Service (SAAS) companies offer suites of marketing automation software that are affordable for small and medium size business (SMB's). At Coombs Marketing we are HubSpot Partners. We recommend HubSpot as the best and we drink the (delicious!) HubSpot kool-aid. What IS a Marketing Automation platform? It’s a lot. More than I can accurately describe here. Visit HubSpot. They do a good job and are great examples of “inbound marketing”. State of the art digital marketing tools ALL in one software suite. Your business (hopefully?) has an SEO optimized website, and maybe you do some SEM, email, CRM, social media… and all of these functions are completely different applications from completely different companies. So… nothing works "together". Nothing is easily integrated or automated. Does your website work automatically with your CRM, blog, email, social media platforms, and the analytics for all of them? Probably not. All these separate applications make it very difficult, and basically impossible for the typical SMB marketer to be proficient at the kind of marketing and sales that is essential today. Leading companies win with digital tools. Especially in marketing and sales. A marketing automation platform makes it possible to win! Do more with less. Do things better, faster. Do new things in new ways. Measure it all and get even better!!! On a Marketing Automation platform, your website, your social media, your CRM, and your email “programs” totally connect to each other, with measurement and automation built in. And here's a little magic: Because everything from web, to CRM, to email is integrated, you can now identify prospects and record everything they do. When did prospect X visit? What pages did they view. What forms did they fill out? What emails did they receive? And open? And interact with? An Illustrative Example of Marketing Automation. Our client is a large, full service eye doctor practice. Ophthalmology, Optometry, Opticians, and a retail optical shop. They do everything from eye surgery to fashion eye wear. This is just one “automated” campaign. It begins when a motivated prospect starts to “search”. Customer X (a female) is interested in “Lasik” and Googles the phrase, “How much does Lasik Cost?”. They find our client's website.... because we did the keyword research, and then wrote, optimized and promoted, a blog post called, “How much does Lasik cost”. See what we did there? Yeah… just good customer service and marketing. So the customer has found us. But we want more! The blog post provides really good, “non selling”, information about the cost of LASIK. Sure, our logo branding is there, but for now we provide great information and we want her to trust us as the reliable and reputable business that we actually are. The blog post has clear prominent links to other related LASIK topics and information…ON THE SITE. The page also and crucially, “offers” something. It has "calls to action". It offers an assessment of whether a reader is a good candidate for LASIK. So our customer takes the LASIK Candidate assessment. The assessment is a 10 question "form" (also easy to create in the software!) of "yes/no", fill in the blank, multiple choice, questions. When she finishes the questions, she must enter her email in order to get her customized results. So she does enter her information. That's good. We now have identified her. AND we know all her form answers. Her name and email goes automatically to our CRM and creates a CRM entry that follows her activity with us forever. It tracks her on our website, and all our email correspondence. Our software automatically sends her an email with her results. Our software automatically records if she opens and reacts to that email. Our software also automatically puts her in an automated “nurture” email list that automatically sends her a series of emails over the next month or so. Our software also automatically “retargets” her by placing ads in her specific Facebook feed (or others), or during other Google searches. Of course our original email to her contains more and better offers. If she IS a good candidate for LASIK, she is offered a free consultation on Lasik with our surgeon. If she is not a good candidate, other appropriate services are offered. After all, we know she has some kind of eye problem. She can actually choose appointment times in a calendar on our website, and get a confirmation and a calendar invitation, you guessed it, automatically. All of this has happened automatically. No one in our client’s office has yet directly contacted this person. However, because they are a very great, customer focused business, they do contact the prospect personally. How does that happen? When certain criteria and thresholds are met, our software AUTOMATICALLY sends an email to our customer service rep describing the prospect, linking to her CRM record, and providing automatic email templates they might use to reach out to the customer. That's just one "automatic campaign". There are many others tailored to specific customer desires and needs. HubSpot software by itself provides every major digital tool a small business might need, as well as native integrations with all the other major digital marketing tools. Today, customers want to learn about you, and probably do business with you online and digitally. Marketing Automation makes that possible. Again, large business has done this for years. But now, the software and expertise for this has become usable, and affordable for SMB. It's a subject far too big, comprehensive, and yes... complex, for one blog post. But it actually makes sophisticated marketing/sales possible for small business. And it is essential. Want to learn more about Marketing Automation? 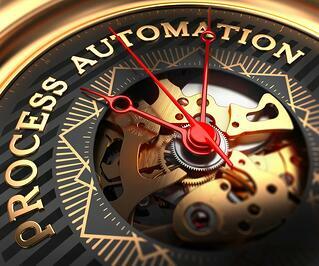 Check out HubSpot's, What is Marketing Automation? A Beginner's Guide. Want to learn more about Inbound Marketing? Download our free eBook, Inbound Primer-an essential introduction.